The key advantages of online groceries are: a) lower costs thanks to single delivery centers and lower manpower; b) efficient farm to home supply chain and high control over quality; c) less shrinkage (pilferage, perishability) and higher stock turns; and d) better gross margins at 20%. Technology plays an important role in demand forecasting and tracking deliveries (since all vehicles are GPS-tagged). 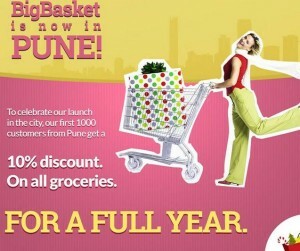 BigBasket delivers in the entire city wherever it operates. It delivers 99.3% of the orders and guarantees that whatever is ordered will be delivered, else 50% of the item that is left out is credited to the customer’s account. BigBasket is heavily relying on Technology at all levels to achive such a massive level of fulfillment. It has 12,000 SKUs (likely to go to 18,000 later this year) and its private label target is to go to 40% share of GMV in the coming years. Repeat rates are high, with customers ordering 2-3x a month, while returns are low at 1% (which includes non -delivery when consumers are not at home). Cash on delivery accounts for 50% of the GMV. Average ticket size is Rs1,500. Big Basket Management expects to hit a share of 2-3% of the grocery retail market in the next 4-5 years. The company also plans to extend coverage to 40-50 cities in the coming years.